We regret to record the death of Mr Ernest Nelson who passed away at his residence, Vautier Street, Napier, at the age of 50 years, after a long illness which developed about a week ago into blood poisoning and paralysis of the brain and spine. 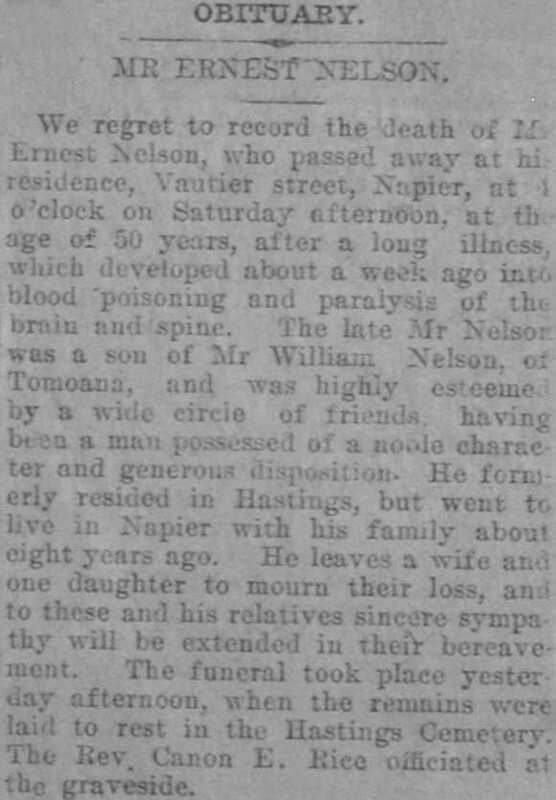 The late Mr Nelson was a son of Mr William Nelson of Tomoana, and was highly esteemed by a wide circle of friends, having been possessed of a noble character and generous disposition. He formerly resided in Hastings, but went to live in Napier with his family about eight years ago. He leaves a wife and one daughter to mourn their loss and to these and his relatives sincere sympathy will be extended in their bereavement. The funeral took place yesterday afternoon when the remains were laid to rest in the Hastings Cemetery. The Rev. Canon E. Rice officiated at the graveside.